Creating your dream wedding requires a tremendous amount of time, energy and effort. Add to that the challenge of serving a gluten-free menu and ensuring your guests have a satisfying dining experience, and it can be overwhelming. My husband and I just returned from celebrating our tropical wedding—it was a fantastic experience! My two main goals were to spend quality time with everyone attending the wedding and ensure that all wedding events, from cocktail receptions to the wedding dinner, were gluten free. I wanted to be able to enjoy all the wedding cuisine, while our guests would not even notice the missing gluten. To reach these goals, my husband and I decided on a destination wedding. That may sound risky, considering the challenges traveling gluten free can bring. But it turned out to be an incredible, and surprisingly easy, experience. Here are my tips on how to successfully plan a gluten-free destination wedding. I love to vacation at all-inclusive resorts. It is not just the convenience of having your food, drinks and activities included, but also the fact that many have some unique culinary experiences. Service is outstanding, food is amazing, and anything you could want is available. Some resorts are better than others when it comes to food allergies, but my husband and I have found several that are exemplary. My favorite all-inclusive resorts have been in Riviera Maya, an hour south of Cancun, Mexico. The idea for a destination wedding at a resort that could offer an excellent gluten-free experience was born from reviewing several resorts while blogging and consulting. A destination wedding provided the time and atmosphere to bring all our friends and family to one magical place and spend a few days of quality time together. We hoped the gathering would be stress-free—that time essentially would stand still. We definitely achieved our first goal—the quality time we spent with our loved ones lounging beachside, in the hot tub, running on the beach or lingering over long dinners was incredibly special. 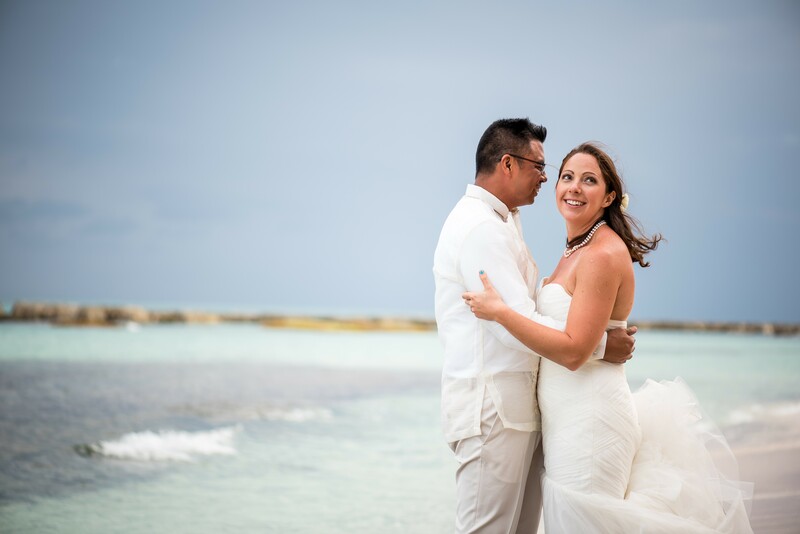 We chose Generations by Karisma Hotels & Resorts in Riviera Maya, Mexico, for our wedding. Most all-inclusive resorts are adults only, which I usually prefer. For our wedding, however, we did not want to exclude our friends’ children. How could we not have a flower girl or ring bearer?! Thus, the family-friendly atmosphere of Generations was very important. The Karisma resort was divided into three sections: Generations, the family-friendly side, and El Dorado Royale and El Dorado Casitas, both adults only. Adults can use all three resorts, which include 18 restaurants and numerous bars and pools. Kids have to stay at Generations, but with great food and endless kid-friendly activities, they didn’t want to leave. Generations also offers babysitters and butlers to care for children of any age so parents can venture to the other two resorts. The Karisma network of resorts uses Lamos for its wedding planning services. The Lamos team allows you to customize every detail. Most destination weddings have a handful of packages to choose from, but Lamos allowed us to choose every detail of our decorations, food, locations and even the type of events we wanted. We had the ability to bring in our own band and photographer and were not limited to the resorts’ vendors. With multiple wedding planners available for giving advice during the process, they made the planning easy. Deciding on colors, flowers, lighting and all the details of a wedding can be tedious, but the planners, once told our general preferences, offered fantastic, customizable suggestions. Weddings in the U.S. cost an average of $26,444, according to The Wedding Report, with couples typically spending up to $33,000—and it’s possible to spend much more. We spent a fraction of that. Since our guests stayed at the resort and made the event their vacations, it was a win for everyone. We chose expensive details without breaking the bank. Decorations and extras such as a cigar roller were reasonably priced. With local tropical flowers available, it was easy to choose what I wanted at low cost. We had 55 people and spent a bit extra on specific items. In the U.S., our wedding easily would have cost $75,000. Our guests booked with a group travel agent at a special trip rate that included discounts on many of the resorts’ amenities, such as the spa and excursions. The agent handled all the details of the trips. Most importantly—the food! There’s nothing worse than getting sick on vacation. El Dorado Royale is well known for being a gourmet, all-inclusive resort. 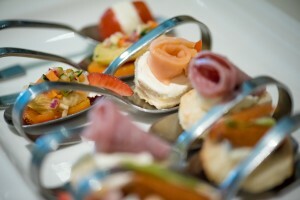 Breakfast, lunch, dinner, snacks and room service all are gourmet quality and unlimited. Eat lunch twice. Try two restaurants for dinner. Order room service all day. All menus at every restaurant have a GF stamp next to gluten-free items. Often those without a GF stamp can be prepared gluten free upon request. The resort offers gluten-free soy sauce for sushi, gluten-free cakes for weddings, and, best of all, gluten-free bread at all meals. The buffets all had gluten-free corners with a selection of cakes, sliced bread, rolls and muffins, with a gluten-free toaster. The resort also has a health bar that makes smoothies and healthy treats. At coffee areas around the resort, cookie jars include one filled with individually packaged gluten-free cookies. Laura Hahn, author of the cookbook Around the World One Gluten-Free Meal at a Time, is a regular contributor to Gluten-Free Living. She also blogs about gluten-free food at GuiltFreeFoodieCutie.com.